Formerly known as Katherine Gorge, the name of this remarkable escarpment country changed to Nitmiluk Gorge when it was handed back to its traditional owners, the Jawoyn people. Nitmiluk, pronounced Nit-me-look, literally means Cicada Place. The Nitmiluk National Park sits at the southern end of Kakadu National Park and the Aboriginal-owned Arnhem Land in the Northern Territory and is said to be one of the most spectacular areas of Australia. I have to say, I agree. Nitmiluk Gorge is incredibly impressive as it winds along 12 kilometres (7.8 miles) of sheer sandstone cliffs that extend to heights of more than 70 metres (229.7 feet). 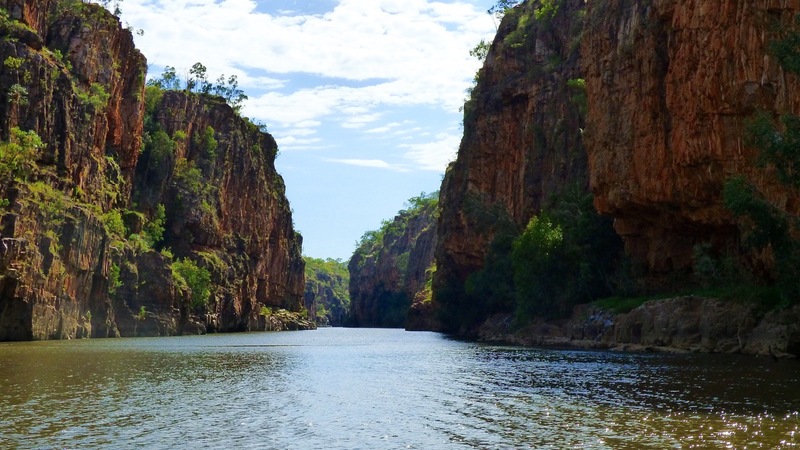 Comprising of 13 separate gorges, Nitmiluk Gorge is a maze of waterways that began as a crack in a fault line, over countless millennia they were sculpted through the power of erosion by what would become known as the Katherine River. We toured the gorge with Nitmiluk Tours who were offering a two hour cruise through the two largest gorges. We so glad someone was operating tours. I could say lots of things about our time on the water, gazing up at the cliffs, but I’ve decided to let my photos do the talking – Enjoy. These are not so much my thoughts about the town of Katherine, but rather what happened getting there. Our drive out of WA and across the border was not without its drama. “What’s that noise?” I asked Dean as we left Kununurra. “What noise?” He asked in return. “That noise!” I said, as I turned the music down a little. “I dunno!” Was the reply I got, just as another vehicle was overtaking us, pointing at Dean and frantically trying to get his attention. “Your bikes have fallen off!” The occupant of the passenger seat yelled as they sailed by. Oh No! Not my bike! 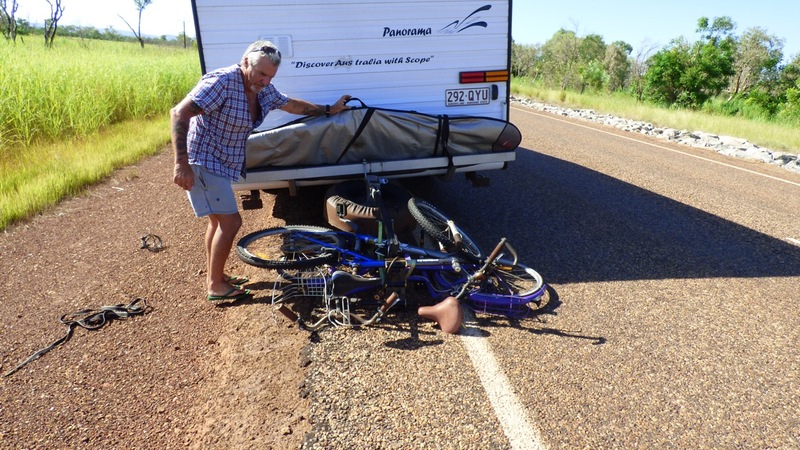 We pulled over as best we could and sure enough, our bikes had fallen off the back of our mini home and the major portions of two U bolts had gone missing. My beautiful, purple bike bore the brunt of the damage after being dragged along for approx two or three minutes on the only stretch of freshly laid bitumen we’d driven on for more than a week. With hazard lights flashing away (there was swamp just off the road), we salvaged what we could, had a quick memorial service as my bike (well beyond repair) was surrendered to the refuse tip, and continued on our way. We rolled into Katherine and headed straight to the Big4 Katherine Holiday Park, an absolute oasis – not that we were anywhere near any desert any more. Luckily we quickly located a metal worker who was more than happy to be given the challenge of fabricating the required U bolt repairs, in exchange for money of course. We didn’t mind staying an extra day in Katherine, as we found the park very quiet, the pool very cool, and the managers very friendly. All big bonuses adding up to a most enjoyable stay. We went for a cruise on the Gorge when it was known as Katherine Gorge and were amazed also. Didn’t know it had had a name change. I’m not sure when the name changed, but it was the traditional owners who renamed it. Thanks for the info about “Nitmiluk” we’d decided it was named after the sounds the frogs made 🙂 Did you have the option of paddling kayaks through the stunning gorges? No, but kayaking would have been awesome. Being the off season, a lot of things were closed and not operating. The two hour cruise was worth it though and we were very glad we got to do that. A bush walk would have been nice also, but the temperature was too hot for us and we decided against pushing our luck too far. Clare, so sorry for your recent loss – I know how much you loved your bike. Always wanted to visit Katherine and your photos have certainly made me rekindle my dreams – maybe in the next couple of years – oops back to work now…. It’s definitely a ‘must see’ place and we are so happy we didn’t miss it being here in the off season. As for my bike – hang on, just wiping a tear from my eye – I guess Dean will just have to buy me a new one when we get home. Thank you 🙂 Comments like that warm my heart.